People have often looked to horses for inspiration. Most recently California Chrome was the horse with a story, the one the nation was talking about but he wasn’t the first. I stumbled onto the book at Barnes and Noble because there was a horse on the cover. 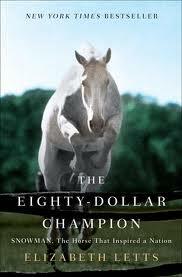 Then the title, ‘The Eighty-Dollar Champion: Snowman, The Horse That Inspired a Nation’ had me hooked. 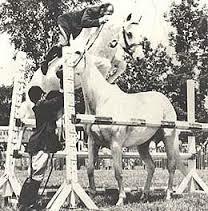 The book was written by Elizabeth Letts who came across an unusual photo of a horse, Snowman, jumping over another horse. Her search to find this mystery horse lead her to the even more unbelievable story. She interviewed many of the people in the story and researched the rest. The shortest version of the story is that Harry de Leyer rescues a horse from the killer truck at an auction. The sweet gelding grows strong and becomes a great lesson horse but it appears will never be more that that. Harry sells Snowman to a doctor for his young son…only Snowman had other ideas. He begins jumping fences to return to Harry. From the killer truck to Madison Square Garden the author was correct in thinking she had found a story worth telling. She also manages to weave plenty of history about show jumping, WWII, and the 1950’s into the story. As usual my favorite parts were in the barn; Snowman jumping his way home, giving lessons, swimming and even his final walk with Harry. If you find yourself looking for a inspirational-horse-history book take a look at this one. I downloaded it on my Nook but I also saw it in hard copy in the store. You can view the book on Amazon by clicking here. ← Is a 'Quarter' horse named for the running distance or the one-quarter Arabian blood? I just finished listening to the audio book. What an incredibly well done book. I laughed and cried listening to it. I was also impressed with the history that was woven into the story. Now I know the story behind another of the incredible Breyer model horses. 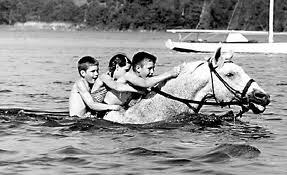 what is your take on “diving” horses?? ?…… I loved the movie “Wild Hearts Can’t Be Broken”……. but it still made me cringe when I saw those horses falling head first…. I didn’t like it! I love this image with the six children! I will be buying that book, amazing! He looks a lot like Nicky a horse I raised, that now belongs to Anna. I am pretty sure she will make him a champion. He missed out when he was younger as my huband got very sick, but now he has someone to work with him and to love him. This makes me so proud and happy. I devoured this book last year! Just loved it, such a feel-good story. My parents took me to the Garden horse shows when I was a pre-teen and I would bet Snowman was there one of those years. I’ve read the eighty-dollar champion! It’s a great book!! I now will really date my self, but as a teenager, I saw this horse jump at a horseshows in the northeast. Awesome to say the least. Of course at that time he wasn’t the phenom he became in time, but was an excellent piece of horseflesh and great jumper. His notoriety came later. I think that Disney made a movie about this horse. If it is the one I am thinking of he competed on the USE team. Fantastic, amazing book !!! If you are a horse lover, this book is a MUST ! I have heard of this story for years. Perhaps it’s because I don’t live too far from New Holland. I am planning on reading the book next week when I am on vacation. I have been looking forward to it. Hope they make a movie. I have this book and love it. It is a wonderful story and I have heard that it will soon be a movie.